A common misconception about the Trump campaign is that he used social media to bypass the mainstream media. In fact, the very opposite is true. Trump developed a hybrid media campaign to drive and frame mainstream media coverage using social media. This strategy relied on the interdependence between new and old media logics which Andrew Chadwick sets out in the revised edition of his book 'The Hybrid Media System'. In his book Chadwick argues that previous notions of new and old media, and of fragmentation and diversification, fail to pay attention to the importance of the interdependence between media. Heroic ideas of how political movements may bypass mainstream media gatekeepers miss the real opportunity, namely influencing, shaping and integrating mainstream media into the core of your campaign. It is difficult to understate the importance of the mainstream media. In my previous research on Brexit I found that almost half of all social media engagement with articles about Brexit, were with articles from just three mainstream media publications. It is why Wikileaks worked with mainstream media to gain maximum exposure. Social media is changing the nature of political communication but not simply bypassing mainstream media. It is creating a new hybrid media where there are strong interdependencies. 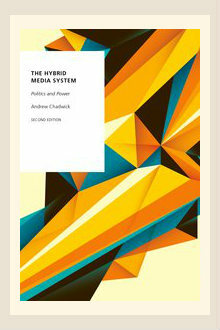 Chadwick's analysis focuses on hybridity, power, media logics and the media system. Personally I think it is a must read for anyone trying to understand this area. Note I may be biased, as like me, he was also a Masters student at LSE studying political communication, though many years back now. In the updated September 2017 version of his book Chadwick explains how Trump made effective use of a hybrid media strategy. Below is my take. Trump recognised the inter-relationships between real events, the internet, social media and mainstream media. A campaign rally for example, attracts media coverage as it creates drama, narratives and symbols for the media and also content for activists and partisans. Chadwick argues that Trump benefited from events such as rallies, press conferences and interviews that were staged specifically for the media. Trump himself acknowledged that “big rallies” generated free media coverage. Trump also used rallies to grow his email list and improve his fund raising. People had to register on his website to attend and confirm their attendance on their mobile phone, gaining details for hundreds of thousands of his supporters (Green & Issenberg, 2016). Dual screening is where people switch between devices, for example watching a live broadcast or TV programme and also discussing or watching comments on social media. This has become very common place and can help frame views of events as they unfold. 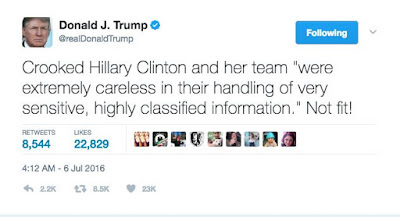 Trump would dual screen himself, tweeting and commenting about what he was watching on live television. This was not just about framing, it potentially created a feeling of solidarity with his supporters who were also watching. Trump deliberately wound up the liberal mainstream media to gain attention. This included attacks on Mexican immigrants, women and journalists. It also included a rejection of “political correctness” and a complete disregard for accepted norms of behaviour. Outraged journalists would enthusiastically highlight Trump’s illiberalism but this coverage only served to motivate his supporters. Chadwick argues the media were seen as “coastal liberals” who did not understand “middle America” which played to Trump's base. Journalists may also have been encouraged to write about Trump not simply because he was different but because content about Trump drove higher levels of engagement. These metrics looked good in the newsroom. This is a key area which I explore below. Trump recognised the power of online social media and invested more in Facebook advertising and digital than Clinton (Lapowsky, 2016a). By using simple tools such as Facebook’s “Lookalike Audiences” campaigns can now rapidly reach audiences that may be likely to support their candidate. You simply upload your supporter list and Facebook will find people who share similar demographics and interests. This technique may have identified “shy” Trump supporters that were not picked up by more traditional canvassing methods. Trump also used his previous celebrity to grow his network. At the end of the campaign Trump had 12 million followers on his Facebook account, 12.9 million Twitter followers, and 2.92 million Instagram followers. Trump was seen as authentic as he personally tweeted and updated his Facebook page with content. Trump’s authenticity was reinforced by posts that included spelling errors, uppercase shouting and exclamation points (BAD! Sad!). Trump used this “amateur” style frequently. Analysis has shown it was present in 54.5 percent of Trump’s tweets but only 12.9 percent of Clinton’s (Gunn Enli’s 2017). Trump’s social posts drove a significant amount of engagement. His Facebook posts gained 208.1 million likes, comments, and shares from 1st January 2016 to 6th November 2016 (Meyer, 2016). This compares to 72 million for Clinton. Trump’s posts Instagram posts received 53 million likes and comments to Clinton’s 31 million. On Trump’s favourite platform Twitter his posts gained twice as many likes and retweets as Clinton’s. 89.5 million to 41.6 million. Some scholars are cynical about the importance of this so called clicktavism. However, it does mean people become involved through their liking and sharing, it also has a far more powerful aspect: driving mainstream media coverage. Chadwick argues that social sharing optimization (SSO) has now replaced search engine optimization (SEO) and references Karpf (2016a: 93–122). I would disagree, there was a short period when this was true but changes in social media algorithms, particularly the Facebook newsfeed, means this is no longer the case. It is still significant but public social sharing has fallen dramatically since 2016. It is increasing in private messaging spaces but this is not visible. It is also much harder now than in 2016 for articles from smaller, more partisan sites to go viral. Since the election, and possibly shocked by it, Facebook has increased the visibility of quality articles being shared and lowered the visibility of articles from sites that they do not deem as quality sites. Thus the impact of articles from outside the mainstream media is much, much lower than it was and this reinforces the need for political campaigns to get coverage in the mainstream media. Trump’s strategy was to shape the conversation in newsroom editorial meetings to frame the issues under discussion. He therefore posted on social media at times that would have the greatest impact on these meetings. The jury is still out on whether Facebook advertising can persuade people to vote in a particular way but there does seem to be evidence that it can motivate supporters and increase turnout. Facebook has previously claimed that they can increase turnout through messaging and have evidence to back this claim. The Trump campaign tried to use this in reverse and to suppress the turnout of opposition voters. There are many elements to a hybrid media strategy as we can see above but does it work? In terms of coverage it is estimated that the media’s coverage of Trump effectively provided him with $4.96 billion of ad-equivalent coverage, while Clinton earned only $3.24 billion. Thus Trump gained an additional $1.72bn of coverage. Possibly more important than the extra coverage was Trump’s ability to frame the issues under discussion in the mainstream media in a way that appealed to his supporters. The power of the mainstream media remains immense but Trump's hybrid media strategy recognised the interdependence of media to help shape his communication and coverage. Rather than bypassing the mainstream media Trump integrated it into the core of his campaign.